This Arctic plant is found in the North Temperate and Arctic regions in Arctic Europe, N. and W. Asia, N. America, Fuegia. It is unknown in early plant beds. In Great Britain it is found in every county except in Hunts, Mid Lancs, Haddington, as far north as the Shetlands, and up to 3700 ft. in the Highlands, as well as in Ireland and the Channel Islands. Heath Hair Grass is commonly distributed in the upland regions of the country, especially in dry stations, the borders, for instance, of rocky woods, where on sandy knolls it is a common plant. It is characteristic again of heath and common-land, as well as moors, up to very high elevations. This plant is similar in general habit to the Silvery Hair Grass. The stem is erect, slender, glossy, and leafless above. The leaves are bristle-like, short, curved, blunt, grooved, and glossy. The upper leaves have long sheaths, and are rough. The ligule is short and blunt, or truncate. The flowers are apetalous (without a corolla), in panicles which are spreading, wavy, or flexuose (hence the second Latin name), divided into three branches. The spikelets are purple, glossy, with long-pointed empty glumes, and long-twisted awn, half as long as the rounded spikelet, and coming from the base of the palea. The plant is 6-8 in. or even 2 ft. high. The flowers may be found between June and August. Heath Hair Grass is a perennial, propagated by division. There are 2 flowers in a spikelet, and sometimes a male flower is produced on the rachilla. There are 3 stamens, with bluish-black anthers, distinct styles, and feathery stigmas. The flowers are pollinated by the wind. The stigma and anthers ripen together. The flower opens between 5 and 6 a.m. The fruit is light and easily blown away by the wind. 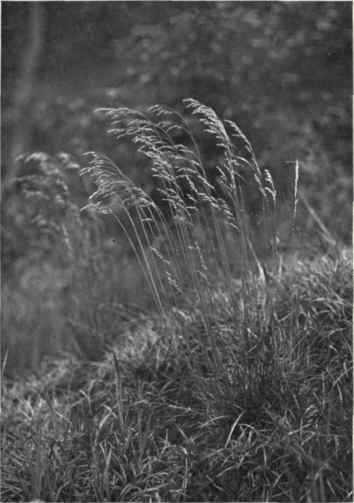 The Heath Hair Grass is turfophilous, growing on humus soil. The name Deschampsia, Beauv., is in commemoration of a French chemist, M. H. Deschamps. The second Latin name refers to the wavy panicle. Essential Specific Characters: 334. Deschampsia flexuosa, Trin. - Stem smooth, erect, leaves filiform, solid, terete, upper sheaths roughish, panicle spreading, wavy, the spikelets exceeding the awn.